Margaretta Jolly is Reader in Cultural Studies in the School of Media, Film and Music, University of Sussex and directs the University’s Centre for Life History and Life Writing Research. Her work has focused on auto/biography, letter writing and oral history, particularly in relation to women’s movements. She first enjoyed psychogeographical walking with the Wrights and Sites ‘misguide to Exeter’. More recently, Olivia Laing’s writing inspired her to get lost in her home town of Lewes. She published Thank you, Madagascar: The Conservation Diaries of Alison Jolly, her late mother’s last book, in 2014. Lyn Thomas is currently writing ‘Clothes Pegs’, a memoir exploring gender, sexuality and class, and charting her move from working-class to middle-class culture through the theme of clothes. A series of short texts, each based on memories triggered by a particular garment, is pegged on to this narrative line. Lyn is the author of two books on the contemporary French writer Annie Ernaux, with whom she has corresponded for more than twenty years. She has also published on feminist fan cultures, lifestyle television, religion and media, and on working-class whiteness. She is part-time Professor of Cultural Studies at Sussex University. Adam Whitehall is a CHASE funded Creative and Critical Practice PhD student at the University of Sussex. His interdisciplinary thesis and portfolio take a phenomenological perspective on transformative experiences brought about by documenting and mapping modes of drift during travel. Current projects include a serial re-reading of the last path walked by author Virginia Woolf from her home in Rodmell to her watery grave in the River Ouse. He is also researching for an installation on the history of the cinema of the moving panorama. Adam is creative director of the New Pathways research project and creator of ‘Mappenings’. Ross Adamson is senior lecturer in Media Studies at the University of Brighton. He’s currently undertaking an Ed.D at Bournemouth University focussing on literacies in documentary filmmaking. He researches in digital storytelling and documentary filmmaking as educational practices and was drawn to psychogeography as an inspiration in storying walking journeys. Catalina Z. Balan is an award-winning filmmaker and video artist, a passionate practitioner in the diverse fields of digital media: documentary, short fiction, experimental, sound and video Installation. She has recently completed a postgraduate degree in Digital Documentary at the University of Sussex, researching and developing a creative practice exploring the potential of hybrid documentary form as a method of narrative representation. Her topics of interest involve society and the human existence interlacing this at times with science, poetry and performance. For more information regarding her latest work please visit her official website: www.catalinabalan.co.uk. Helen Cann is a fine artist and illustrator who explores contemporary cartography with a particular interest in hand drawn maps. She is especially interested in how location can be understood through narrative – how we understand where we are by listening to and telling personal human stories about a place and how that blurs the underlying stories told by traditional mapmaking – of politics, boundaries and beaurocracy. Helen exhibits widely and more of her work can be found at www.helencannfineart.co.uk. 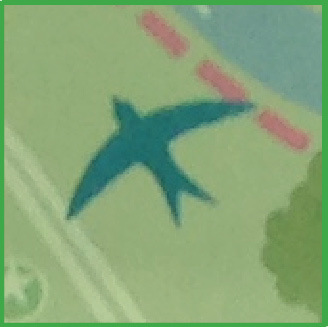 Giclee prints on archival paper of the map of Lewes created for the New Pathways project (and used throughout the Mappenings) can be bought by contacting Helen through the website. Prints cost £65 plus postage. Ben Carter is a landscape architect currently working for The Royal Parks and passionate about making landscapes work for all their users. Nancy Carter is a EAP lecturer and teacher trainer at the University of Brighton, but so obsessed with walking that she is currently walking the coastline of mainland Britain in manageable chunks. 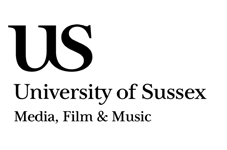 Robert Cooper is Head of Media Studies at the International Study Centre within the University of Sussex. He specialises in Media Practice and in particular photography, which has formed the larger part of his personal output over the last twenty years. He previously studied Fine Art at Goldsmiths College for his Batchelor of Arts degree, where the culture of experiment and rigorous critical practice formed his character and style. Later he studied English Literature and Creative writing for his Master of Arts at the University of Sussex, and creative prose and poetry still continue to be an important part of his creative work and interests. Janette Fowler was, at the time of the Mappenings project, a resident of Seaford. She now lives in Brighton where she is currently studying on the Cultural Astronomy and Astrology MA at the University of Wales. She is a keen researcher on alternative histories, as well as an avid walker and explorer of the south coast. Amanda Geary graduated as a schoolteacher then retrained in complementary medicine. She has an MSc in Complementary Therapy Studies from the University of Westminster, founded the Mind-backed Food and Mood Project and is the author of The Food and Mood Handbook. Amanda now volunteers in the areas of literacy, and dementia care. She moved from Brighton to Lewes in 1999. She lives simply, preferring to avoid social media networks and iphones, and enjoys local walks, swimming, and playing cello in a music group. Amanda has kept a daily journal for over a decade and several of her poems have been published. Michael Guida is a PhD researcher in Media and Cultural Studies at the University of Sussex, where he is exploring how the sounds, rhythms and quietude of nature have been used to afford psychological welfare in Britain, 1914-1945. Matthew Homer gained a First Class Honours in English with Media Studies from the University of Portsmouth and a Masters degree in Literature, Film and Visual Culture at the University of Sussex. He also graduated from the University of Brighton with a Distinction and the Fred Inglis prize for the Postgraduate Certificate in Creative Media. Matthew recently led an open forum discussion at the University of Brighton about his latest film Democracy For All. This work looks at how politics can be made more inclusive for people with a learning disability. His previous digital media projects include a radio documentary about the effects of the London 2012 Olympics on local residents and a film on football and fandom in Japan. Mark Johnson : “I am a former Sussex MA student who’s currently residing in West Lancashire, working for a major UK bank by day whilst attempting to produce unlistenable electronic music by night. Other hobbies and pastimes include playing for a local 5-a-side football team named after a nearby fish and chip shop and visiting the major marzipan-producing nations of Europe as often as my budget allows”. Wilma de Jong is a Senior Lecturer in Media Theory and Practice at the University of Sussex. An anthropologist who became a film maker, Wilma owned and ran an independent film company for thirteen years. Author of several articles on documentary production and teaching documentary, she is also co-author of Creative Documentary, Theory and Practice (2012) and Rethinking Documentary: New Perspectives and New Practices (2009). She continues to make short films and currently has a documentary in production on DIY practices in Development Aid among civil society groups. She is also writing an article about the Oscar-nominated, Scottish-Yemeni film maker Sara Ishaq. Alexandra Loske is a curator and art historian with a great personal and professional interest in colour, having spent several years researching colour theory and colour in historic interiors. While she would never touch a paintbrush herself, she is fascinated by how artists use the tools of their trade, in particular pigments. Alexandra frequently visits artists in their studios in order to find out how they use colour. She thinks of Sussex in terms of greens and whites and has mapped out Lewes according to where artists live and work. Wendy Maples‘ academic work spans several fields, including anthropology, cultural studies, environmental politics and the pedagogy of higher education, particularly distance and blended learning, honed whilst a Senior Lecturer in Geography and Staff Tutor in Social Sciences at the Open University. She has a life-long interest in both human/environment liminality and in the craft and function of creative and formal academic writing. Wendy lives in Lewes, the only town with the Sussex Downs National Park boundaries, and enjoys the stimulation of the town’s eclectic political and literary heritage and vibrant contemporary culture. Michael O’Brien is currently a senior lecturer in photography at the University of Roehampton London. In a photographic career spanning the arts, photojournalism and corporate communications he has published widely across national and international media. In recent years he has developed personal projects as an aspect of his practice research. These revolve around issues of place, memory and identity. Tanya Shadrick grew up on the North Cornish coast before studying English at Sussex University. First in her extended farming family to leave home, place and belonging are central to her writing. Informed by her own near-death experience and life story work with hospice patients, Shadrick also explores moments when financial, familial or physical emergencies insist on life in limited space – small towns, sick beds, retirement flats. After 20 years of writing as a wholly private undertaking, her first published pieces are appearing here and in the Frogmore Press anthology True Tales from the Old Hill. 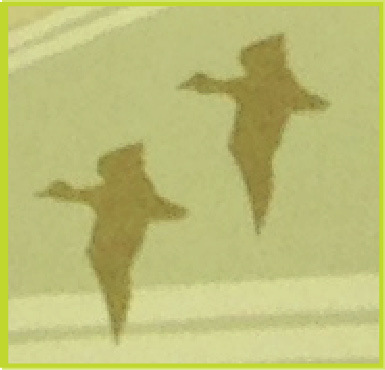 She is currently accepting submissions to her Lewes dream bank project, The Illustrated Soul. Abbie Stanton is a professional animator, photographer and maker. A multidisciplinary artist with a wide variety of skills and techniques, she has worked on a slew of disparate projects, both collaborative and solo. Ventures include: directing large-scale projection mapping; animation for broadcast and web; bookbinding and pop-up books; costume design; modelling props, sets and characters for animation, as well as designing and building large-scale tableaux for Lewes Bonfire. In essence, Abbie is a visual storyteller pulling inspiration from the world around her. She talks to strangers in coffee shops and is a born flâneur. Rachel Tavernor is a doctoral researcher in Media and Cultural Studies at the University of Sussex and resident of Lewes. Her research explores the visual communication of humanitarian campaigns that request protest action. Before her studies at Sussex, Rachel was an activist for NGO campaigns. She has taken part in the longest protest march in Britain (walking 1000 miles), stripped off 20 campaign t-shirts on the Fourth Plinth in Trafalgar Square and has photographed development projects in Ghana and Tajikistan. Rachel is the founding editor of RE.FRAMING ACTIVISM, which is also published by REFRAME. Lydia Marie Storm is a born and bred Copenhagen resident, currently studying for a degree in Social Work in the Danish capital. A keen traveller, the only continent she hasn’t spent time in is Antartica, and she’s lived for substantial periods in the UK, France and South America. In her spare time, she enjoys her reputation as Denmark’s biggest Pointless fan, and has a slight obsession with the PG Tips monkey. Bruce & Penny Whitehall Bruce is a free-lance journalist and filmmaker with the Sutton Film Makers. Penny is a published poet, playwright, novelist and illustrator. Together they run www.penbrink.com promoting Penny’s charming nostalgic illustrations of figures and faces for commercial uses. Helen Cann Artist’s credit for the ‘Mappenings’ map. 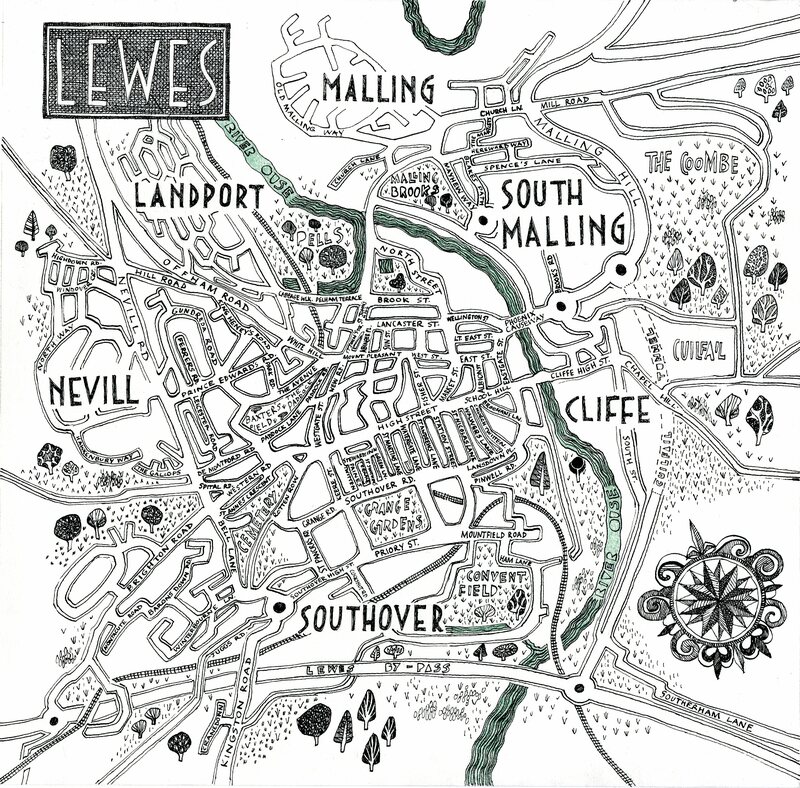 Giclee prints on archival paper of the map of Lewes created for the New Pathways project can be bought by contacting Helen through her website: http://www.helencannfineart.co.uk. Prints cost £65 plus postage.